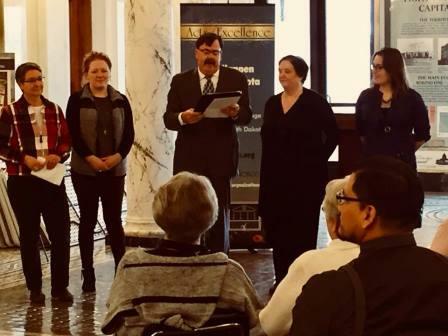 The South Dakota Historical Society Press, an office of the South Dakota State Historical Society at the Cultural Heritage Center in Pierre, recently received an Act of Excellence award from the South Dakota Hall of Fame in Chamberlain. During a ceremony on Thursday, Jan. 18, in the Capitol Rotunda in Pierre, Lt. Gov. Matt Michels and South Dakota Hall of Fame Chair Randy Houdek credited the press with working to preserve and promote South Dakota’s history and heritage since its founding in 1997. The press was nominated for the Act of Excellence by Terry Woster, a former reporter and columnist with the Associated Press, Sioux Falls Argus Leader and Pierre Capital Journal. The South Dakota Hall of Fame aims to champion a culture of excellence in South Dakota, one act at a time. Additional information about the Act of Excellence and past awardees can be found online at sdexcellence.org.